bknelson052173: Tough Questions #2: Why is it so loud? For the background on why I'm posting these tough questions, you can read the introduction to the first post in this series. Why is it so loud during worship?! Can we turn it down? Great question! First, you need to watch this video all the way to the end. Don't miss the end. What a great conversation about volume levels and how we perceive it! Can you believe that there is also the opposite question as well...Why is it so soft during worship? Can we turn it up? If you get these two people together, they'd probably look at each other in disgust and dialog about how in the world they feel the way they do. But that's precisely why setting a volume level is a very difficult, but very important task. It's something that both Nat (Technical Arts Pastor) and I consistently work on together. Volume is both a preference and a physical makeup. We need to understand that what we hear is not what someone else hears. Our physical makeup determines a lot of how we hear. One person loves to crank the volume and have their voice practically drowned out. The next one prefers an quiet easy listening level and to sing softly. Let me ask you something. When Jim (our Senior Pastor) preaches...do you think Jim tailors his message to connect at every moment to both a 3rd grader and a 103 year old seminary professor? No way. There's no way Jim will connect either either the entire time. It's not his job to please them anyway (and it's not my job either in music styles, volume, dress, etc). In fact, seminaries will teach to preach for the 80% in the middle. At times, you may touch on things that reach the extreme level either way - but only touch. 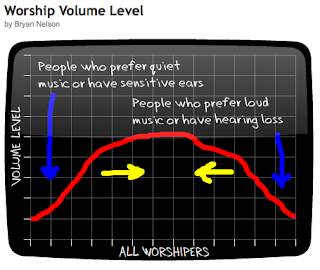 It's the same way with setting volume levels for worship. We set worship volume level to connect with the 80% of the worshipers for that particular worship gathering. If we set the volume to levels that the 10% who like it to sound like that booming sub woofer bass you hear every time they drive by your house as your window panes crackle - we'd have issues. The same goes true for the opposite. If we set the volume to levels that the 10% who like it softer because of hypersensitivity or they are in quiet environments the majority of the time and prefer it that way...we'd have the same issues. There's no way you are going to connect with 100%. McCain and Obama didn't. Jim doesn't. Neither is the guy running sound. 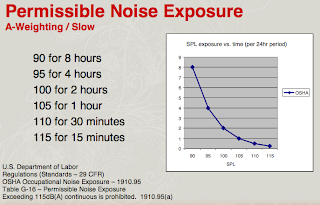 We can assure you that we run sound volume levels for durations of time well under OSHEA safety standard. We monitor every worship gathering with a dB meter. If you'd like to read more about volume levels in a worship setting and OSHEA standards, there are execllent resource at Willow Creek Community Church's page on volume. And, by the way, TBC's 2nd and 3rd hour of worship runs our dB meter (volume) lower than Willow Creek's. We operate at 92dB (A weighting, slow) for less than an hour in 2nd and 3rd gatherings. First service is lower than 90dB on purpose. Why? Because we know that the 80% in the 1st hour tends to be a quieter bunch. So Bryan, you use Willow Creek as an example - are we trying to be like them? Great question! Keep this in mind...not only do 15,000+ people worship their weekly - they keep coming back. And they have some of the most experienced professionals on staff. Check out their technical site sometime - it's a great resource. And they run some of the world's best conferences for churches. The best sound I've heard in a long time was an experience I had on a Sunday AM at Willow Creek Community Church. I should mention they run their volume a tad higher than TBC and mix a little different. But folks, just because I like Willow Creek's reciepe for an audio mix - this doesn't mean that TBC would like the same recipe. The bottom line is to disover what works best for the 80% at TBC and stick to it. Why is this important? Because we want the maximum number of worshipers to be able to do what they came for...to hear His word and respond in worship to Him. We really are doing the best job we can. Honestly. And we need your prayers. Satan would love to distract us with important non-essentials like these, but we are determined to keep the main mission of TBC the focal point. That's why I'm answering these great questions...to put them in black and white so you have a clear (and maybe a broadened) understanding. Why does Bryan dress like a Hippy? Can Bryan wiggle his hips a little more while he plays the electric, but not the acoustic? You're doing a good job, man.